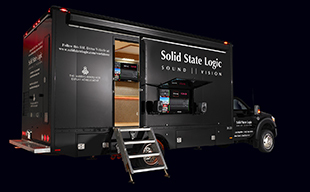 FRANKFURT, GERMANY – Solid State Logic, the world’s leading manufacturer of digitally controlled analogue devices are pleased to announce the first major update for Sigma at ProLight & Sound 2014 (Hall8. L80). The new software will be a free upgrade for Sigma, SSL’s unique Remote Controlled Analogue Summing unit and enables all features of Sigma to be controlled from an iPad or iPhone via Open Sound Control (OSC). OSC is a protocol that allows fast, accurate and flexible communication amongst devices, making it an ideal addition to Sigma’s already extensive feature set. “We’re providing two Touch OSC templates (courtesy of the Hexler TouchOSC app) that allow the user to take complete control of their Sigma conveniently via their iPad/iPhone,” says Andy Jackson, Product Manager. “The TouchOSC templates are highly responsive and make remote control of Sigma a slick and enjoyable interaction. You can control anything from the monitor control, to channel set up and even the analogue “fader” gains of Sigma over OSC. This opens up some really interesting possibilities, not least, using Sigma as a standalone analogue mixer. As a company SSL has always supported the potential of open control standards that allow interoperability across products, something which is the very essence of OSC. As such, we’re publishing our OSC message specification, so that users can customize and make their own templates if they wish”. The Sigma update is due for release in early April 2014 and will be a free download via the SSL website.